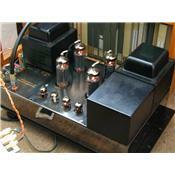 Tube mono power amplifiers, output 200W/channel, 8 and 4 Ohm speaker taps, symmetrically built using four PL519 or PL509 power tubes, drivers are two ECC83 and two ECC85 or equivalents. I`ve been running domestically 4 x 549`s using a Tube Technology Prophet per amp for over 20 years now and all I can say is how wonderful they have been. The sound has to be heard to be believed and I have seen peoples wobbly bits literally wobble with the sound waves these monsters deliver! To say I waited my whole life for this sound would be an understatement and except for an occasional re-tube there has been no problems, faults or anything with them! So I would say if you can find any, buy them!! Best allround amps I know. Can drive even very demanding speakers like the big Maggies to more than adequate listening levels. Fast and deep bass. Transparency, detail and "rightness" with all music. Subjectively much more powerful than the nominal 200W. PL 519 Power tubes are still available cheap. Very rare. Bias adjustment with built-in LEDs is inaccurate and has to be done by hand after opening the case. These wonderful amps are driving my Magnepan 3.6R with ease up to real live sound levels and believe me, the Maggies are real power hogs. When I bought the Maggies from the original owner I brought my 549s for listening test and they shamed the expensive Mark Levinson stuff that guy used. I had them rebuilt by a specialist with the help of Tim de Paravicini as there exist no schematics any more. We used even better parts throughout and increased the power caps by 60 percent. I also replaced the original driver tubes with NOS RCA triple mica black plates and Telefunkens with amazing results. Everything the other review says about the 509s the 549s have in spades, they are built symetrically and twice as powerful, 200W/channel and were originally designed to drive the master cutting lathes in recording studios, apparently The Exchange in London still uses them. These are my last amps, period. Even when I drive them until their clipping indicators blink continuously the sound stays absolutely clean, perhaps it gets a tad warmer and only then they exhibit a bit of that "warm tube sound" otherwise they are absolutely neutral with much more natural timbre and transparency than even my Stax DA-100M monos (100W Class A/ch. ), those were the best sounding transistors I ever heard. Their bass is in a league of its own. I always thought tubes couldn't produce deep bass which is also taut and fast. This has kept me from using tubes until 5 years back. If you can find them buy them! You'll never look back.